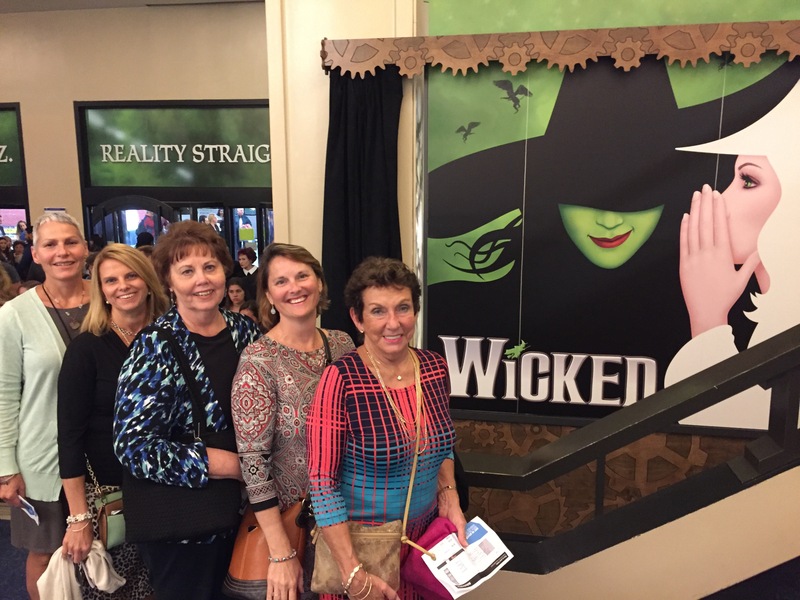 Last night, I took my mother, sister-in-law, and friends to see Wicked. It was the fourth time I’ve seen the production, and If you’ve never seen the it, I encourage you, no I implore you, to run, don’t walk, to the nearest theater at which it is playing. For those who, like myself, read the book and were left shaking your head and wondering what on earth all of the hype is about, trust me. The play is a beautiful celebration of friendship that you don’t want to miss and will never forget. Rather than rehashing to story of Dorothy from Kansas, Wicked tells the tale of the deep and abiding friendship of Dorothy’s good and beautiful guardian, Glinda, and Dorothy’s archenemy, the Wicked Witch of the West, known in the book and play as Elphaba. The most dramatic and pivotal scene is when Elphaba, after casting a spell on an ordinary broom, gains the ability to fly and takes off for the Westernmost reaches of Oz. However, the climax is when the best friends, Glinda and Elphaba, tell each other goodbye. Elphaba laments that she is limited in her abilities to do good, to save the world, which was all she ever wanted to do. She has been cast as the villain, and she tells Glinda that she must now figure out how to save Oz from an evil which is overtaking it in the form of the Wizard (not the good guy Frank L. Baum led you to believe he was). The two friends sing about how their meeting and subsequent friendship is like a comet pulled from orbit as it passes the sun, a stream that shifts when it meets a boulder, a seed dropped by a bird in a distant wood – their friendship is a catalyst for change. Elphaba says that she has heard that people come into our lives for a reason, that we are led to those who need us, who help us to grow. She and Glinda agree that no matter what has happened in the past or what may happen in the future, their friendship has changed them, “For Good.” The song tells us that they are who they are because of knowing each other and that their stories have been rewritten because they are friends (obviously the message of the play). I can honestly say that I am who I am today because of the people who have crossed my path, because of those I call my friends. My friends influenced who I was a child, as a teen, and as an adult. I’ve had to choose wisely, sometimes letting go of people, even close, dear ones, because their influence wasn’t a catalyst for good in my life. I look back and see where I need to seek forgiveness and where old resentments no longer matter. I can look around me and see who has changed me for the better both as friends and colleagues. Many years ago, I met a gal from church who became my very best friend and has continues to be a major force in my life. A few years later, I met the mother of one of Rebecca’s classmates, and now I have two best friends who have changed my life and my understanding of friendship. Almost a year ago, a whole new group of people came into my life. I never thought, when first meeting this group, that they would have such a profound impact on me. A seed was definitely dropped in a distant wood, and its roots took hold and sprouted into a wonderful new life. My daughter, Rebecca, will be taking the LSAT this weekend and I’m sure you can imagine that she’s quite nervous about it. She’s afraid that she won’t get a high enough score to get into the school of her choice, but I’m not worried. I know that she’s going to do just fine. And if she doesn’t? What if she walks in there and completely goes blank? What if she forgets everything she has ever learned or studied about the law? I’m sure that she will see herself as a total failure. I’m sure that she will see herself as having made an unforgivable error in judgment. But we have heard time and again, and I truly believe, that failure is just the first step on the road to success. No, it’s not what she would want to hear, but it’s true. We all screw up. We all make mistakes. And if we take what we’ve learned, see through the haze of self-doubt and recriminations, then we can use our past failures as steps to success. Many of my friends have ‘favorite saints,’ people who have come before us and set an example for us, and can now intercede on our behalves when we need extra help. Many of these saints are seen by the world as flawless believers who never had a misstep or lapse of judgement, who never committed a sin or broke a law, and who never wavered in their faith in God and themselves. Well, those people would be very, very wrong. In fact, most of the saints made the same mistakes we make, but they didn’t give up or give in. They continued to work every day to become the person that God knew they could be. The same goes for so many average individuals throughout history. Michael Jordan was cut from his high school basketball team. Thomas Edison failed 1,000 times before inventing the lightbulb. Henry Ford went bankrupt trying to invent the car. But they all persevered, believing they had something to offer the world. Those individuals did not dwell on failure. They knew that it’s in seeing past the possibility of failure that we achieve success. When Rebecca was in high school, she participated in Poetry Out Loud and blazed through the competition, just missing the chance to compete at Nationals. One of the poems she recited was It Couldn’t Be Done by Edward Albert Guest. His formula to success was quite elementary, “I take simple everyday things that happen to me and I figure it happens to a lot of other people and I make simple rhymes out of them.” Those rhymes are an inspiration to anyone who hears them. Rebecca, I’m sure, remembers every line of that poem, and I urge her to recite it before the test. For those of you unfamiliar with the rhyme, you might just want to memorize it yourself and pull it out of the recesses of your brain when you’re faced with a daunting task. This past weekend, we attended Family Fest at Rebecca’s university, Mount St. Mary’s. We met and spoke with several professors who sang Rebeca’s praises. One of them, a science professor, said that Rebecca reminded her of herself. She said that someone once told her that she was going to be successful because she was too naive to see borders and would just plow through them. There is no doubt that the same has been and will continue to be said about Rebecca. So I’d like to leave her and all of you with some quotes of inspiration. This is the advice that I want Rebecca to take with her into the LSAT this weekend. Be strong, have faith, and do your best. You will not fail because when you look into the future, you can only see the path to success. We spent this past weekend on the island of Chincoteague, located on Virginia’s Eastern Shore. It was one of those rare weekends when we didn’t really have any plans. I had just finished the first draft of my next novel, which takes place on the island, and Ken asked if he could read it. Several chapters in, he told me that he loved the writing and the storyline, but I had many geographical errors. It has been years since I spent any time on the island, and to be honest, I never paid that much attention to which waterways were which or how much marsh there is instead of sand. His remedy? To pack up the camper and head to Virginia. Ken’s brother, Tom, and his family moved to Chincoteague many years ago, but as the children grew older, and life got busier, we found it hard to all get together on the island, so Tom and his crew always come up to Maryland rather than everyone going down to Virginia. But true to his nature, Tom welcomed us with open arms and was the perfect host and tour guide. We arrived late Friday night after watching Morgan’s field hockey game, ironically, just thirty minutes away from her cousins’ home. Ken and I stayed in the camper while the cousins all slept in the house, or didn’t sleep, as they hadn’t been together for a while and wanted to spend as much time together as they could. On Saturday, Tom gave us a tour of Chincoteague, a name taken from the Native American name, Gingoteague, which is believed to mean, “Beautiful land across the water.” It is indeed across the water, across the Chincoteague Bay from the rest of Virginia and across the Chincoteague Channel from Assateague Island, both a State and National Park. Many people my age and older will recall the beloved novel, Misty of Chincoteague by Marguerite Henry, about the pony who swam across the channel to the annual firemen’s pony auction and then made her home on Chincoteague. We drove to the beach on Assateague, passing several herds of the wild ponies, and then back to Chincoteague to Memorial Park and then through the downtown. After lunch, Ken, my mother-in-law, and I struck out on our own so that I could see everything through the eyes of Kate, my main character. We climbed to the top of the Assateague Lighthouse and visited the island museum. At the museum, I learned so many things that had never turned up in my research, such as, when Assateague, once the more populated island, became privately owned, the inhabitants rolled their homes down to the water, put them on boats, and floated them to Chincoteague where some are still standing today, almost one hundred years later! You can bet that someone in my book will live in one of those homes! Also, in the museum, we saw the real Misty, a treat for any girl who, like myself, devoured the book series as a child. Later in the afternoon, Tom and his wife, Sandi, took us on a boat ride. We literally circumnavigated the entire island, and I was treated to a view of the island that I had never before seen. I also found the perfect location for Kate’s winter getaway. To wrap up the day, Sandi served us some of the best crab cakes I’ve ever had. 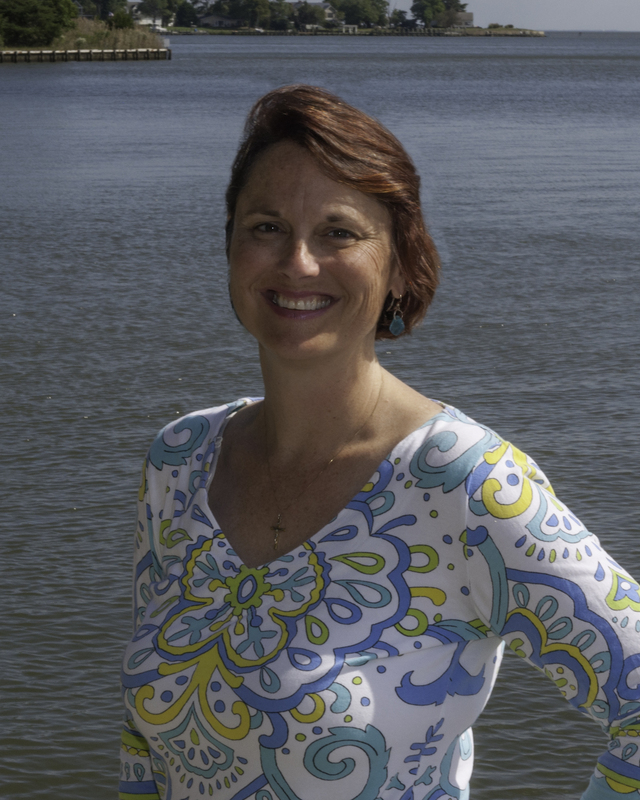 We talked about my book and the island, especially the history of the island as it relates to the Coast Guard. Approximately 75% of the retirees on Chincoteague are former Coast Guard. Those valiant men and women play a large role in my book, and I was honored to spend the weekend of 9/11 in a place where those who serve are held in the highest regard. Banners honoring all of the young men and women currently serving in the Armed Forces are proudly displayed up and down Main Street, including one of my nephew, Ty. As I learned with my previous books, nothing beats personal research. There’s a lot that I can learn and see online, but there’s nothing like visiting a place in person, talking to its people, seeing firsthand its beauty, and immersing oneself in its culture. I am so grateful for the time and attention that Tom and Sandi gave to our tour and my questions and to my husband for giving up his weekend so that my book can be as authentic as possible. I look forward to paying my respects to the people and history of Chincoteague Island. The authors of the book contend that “peer orientation undermines family cohesion, interferes with healthy development, and fosters a hostile and sexualized youth culture. Children end up becoming overly conformist, desensitized, and alienated, and being “cool” matters more to them than anything else.” Wow. Any parent who reads or hears that should stop and think. Is that my child? Have I allowed this to happen in my family? What matters more to my kids – what I think or what their friends think? What I believe or what their friends believe? What I tell them is right vs wrong or what society tells them is right vs wrong? We’d all like to think that our children listen to us, believe us, see us as the main influence in their lives, but is that really true? The premise of the book argues that it is not. In our modern society, parents don’t matter. Sometimes I see it with my own girls – Mom is right about some things, but society is right about most things. How did that happen? Since when did society become the ruling being over all thoughts and beliefs? Doctors Neufeld and Maté tell us that social media pays a large role in peer orientation as does our society’s value of economy over culture. But the biggest factor is the alienation of the child, and this is usually not done on purpose. We no longer live in villages, tribes, or even communal neighborhoods. Extended families live miles, perhaps even states or countries apart. Often, both parents work long hours away from the house, and divorce is rampant throughout our society. Who fills the void? Television, movies, social media, and peers. Children must be “cool” in order to succeed. They lose their own individuality and hide their natural curiosity and intelligence in order to better conform with their peers. One result of this is the rise of the gang culture within many of our cities. Children want, no they need, to feel loved and accepted even it comes from a non-loving source. Children who don’t have that love and acceptance, feel vulnerable and enraged, and lash out at other children as well as themselves, causing emotional and physical harm. This leads to bullying, shunning, an increase in suicide, and in some cases, teens killing teens. By losing touch with our kids, we parents are contributing to the downfall of society, Does that sound harsh, scary even? You bet it does, but there is hope. Parents can bring their children back around by helping their children to see the value not only in their parents but in themselves. The key, according to Dr. Maté is being emotionally present for and nurturing toward our children. He argues that orientation to a mother, a father, a sibling, or peers results from attachment, an “essential for human life.” Children who are detached, cannot be taken care of. They shun attachment and emotion, and they end up shunning others. We need to connect to our families, to our children. We need to spend time together, eat together, vacation together, talk to each other, listen to each other, and help each other. We need to make sure that we parents, our families, are the people to whom our children attach. It’s not a matter of politics or continuing a family legacy. It’s about helping children to know that they have a purpose in life, that they matter, that they are loved and valued for whom they are. acknowledgement about whom it is that matters. Last night, I asked my girls to tell me who they are, how they would identify themselves if being introduced to someone new in our community, not by using a societal description but by answering honestly about how they see themselves in life. My favorite answer was Katie’s. She said, “I’m Rebecca’s sister.” She didn’t say it as a jealous or undervalued younger sister or as someone who simply follows in another’s footsteps. She said this with pride and love. The child I worry about the most identifies herself by attaching herself to her sister. Now that’s an orientation I can live with. First, let me get one thing straight right off the bat. This past Sunday, Pope Francis acclaimed that Mother Teresa is a saint. He did not make her a saint as so many are incorrectly saying. The Church does not make saints. Only God makes saints. The Church acclaims to the world that a person is a model for everyone to follow in their daily lives, thus calling that person a ‘saint.’ Okay, now that we have that out of the way, please allow me to continue. Oh how hard that is. When someone has wronged you, when you’re cut off by another driver, when your child has misbehaved, isn’t one of your first reactions to yell? Often times, mine is, and it shames me. Later, I will always think of so many other ways that I could have better handled the situation. I know, I see it in their faces, detect it in their shift of posture; no child, or any person for that matter, continues to listen once we lose control of our own emotions. We might as well be yelling at a brick wall or an empty chair. And how does that make that other person feel? No doubt, like the empty chair. Like they’re not actually there in your eyes, not worthy of your respect, not worthy of being spoken to with dignity, not worthy of having an open dialogue with you. My children had a favorite middle school teacher. They still talk about her today, the respect she showed them, how hard they were willing to work for her, how much they learned from her both academically and as a person. They often say, when telling others about her, that even when she was angry, she spoke softly, and with a smile. That’s what impressed them the most. That she never, ever lost her temper, never spoke harshly to anyone, never treated another person with disrespect, and was never without a smile. I can’t look at her today without thinking about the impact she had on them, and I pray that they will always take her behavior and attitude to heart. Each of us is called to strive to be a better person, the person whom God created us to be. I know that I have a long way to go, but it helps to have examples all around us that we can look to as role models — saints and middle school teachers alike (heck, I think anyone who teaches middle school must be destined for sainthood). Each of us is called to treat each other with kindness, to see every person as someone deserving of love, respect, and dignity. Every act throughout every day should be an act of love, which brings me to my favorite Mother Teresa quote of all time. May you add your own paragraph to that love letter in all that you do and concerning every person you meet.